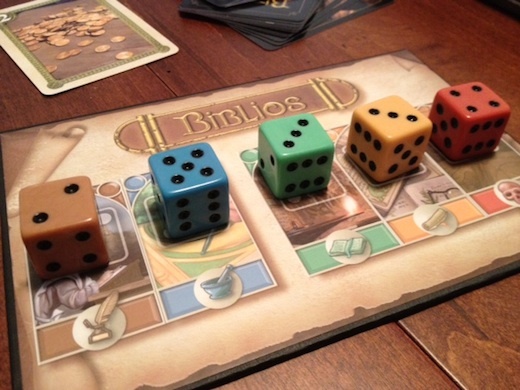 When asking for games with depth that can be played in 30-45 minutes, someone recommended that I check out Biblios. So.... I did. In Biblios, the goal is to get the most victory points by having the highest score in (enough of) the five different categories. To start the game, each category is worth three points. 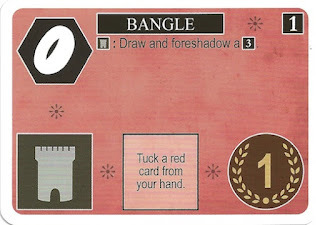 On a player's turn, he will draw a number of cards equal to the number of players plus one. 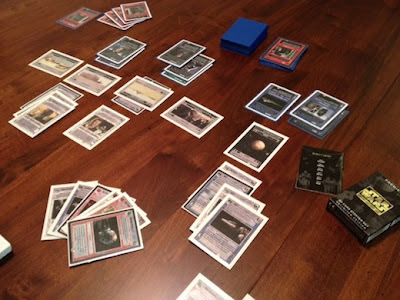 After looking at each card, he must decide if he will keep it (one per turn), put it in the auction pile (one per turn), or put it face up in the middle (all the others). 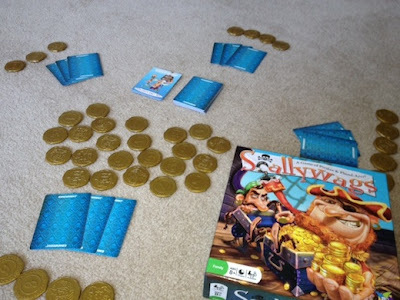 After he has gone through all of his cards, the other players get to take the cards that he placed in the middle - thus each player gains a card every turn. 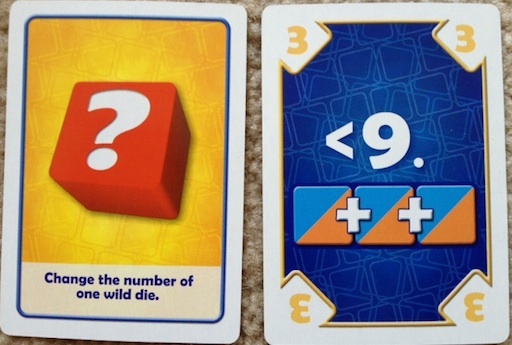 Any time one of the players gets a "church" card, they immediately adjust the value on one or two of the dice (and thus a category's value). 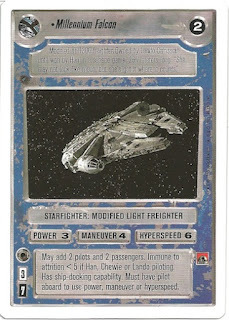 After the deck has been exhausted, the auction phase begins. 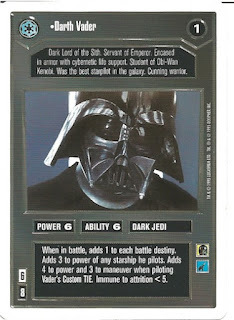 One at a time, all of the cards that were placed in the auction pile are auctioned off to players - who use cards to buy gold cards, and use gold cards to buy everything else. After the last auction, players compare scores in each category and the highest total in each gets the scoring die. Whoever has the most points from scoring dice is the winner! 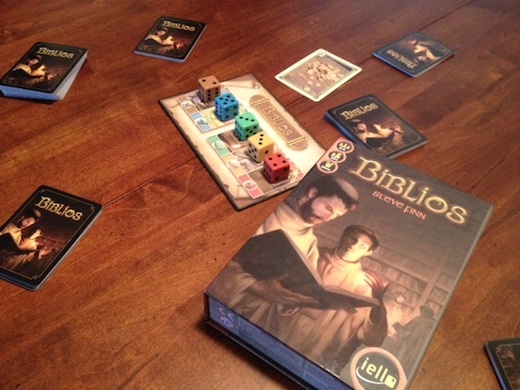 Very ironically, I received my copy of Biblios at approximately the same time as I received a copy of Pax - and both games seem to have a similar core mechanic of "draw X cards, one at a time, and put them in different places." I listed this as a pro in Pax, and it is also a pro for Biblios - this mechanic forces the players to make meaningful, simple, and yet difficult decisions. 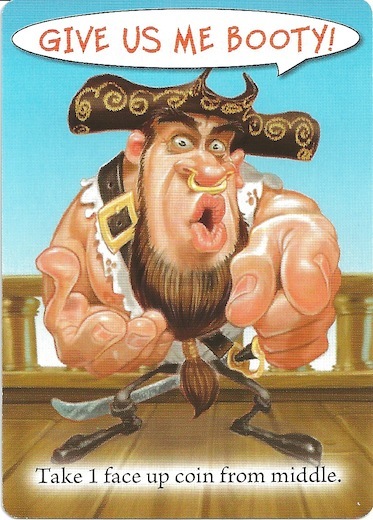 If you make a mistake in the first round and accidentally give your opponents a powerful card, you're not going to instantly lose - but if you regularly give your opponents better cards than you keep, then you don't really stand a good chance of winning. And, with more players, these choices get tougher. You get to look at more cards with more players, and so you will have a much harder time deciding what to do with a mid-value card that you draw early. Should you take the safe bet and keep it? What if something better is drawn? But, you also don't want your opponent to have it! 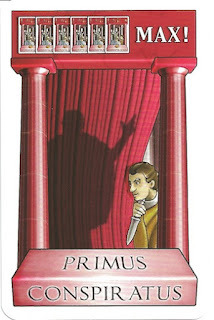 The next pro that I have for Biblios is that I think the auction works well. I have played this game with two and three players, and the auction works well with both (and I would imagine works at least as well with four). It's tough to find a two-player auction game that actually works, but for some reason this one does. I think that there are a couple of factors with this - first, you know that any card you don't win counts directly against you. With three and four players, you might be able to spread out cards in a category so that you can still ultimately have the highest score, even if you don't have a majority. With two players, every card that you don't take goes to the same opponent. Also, the game is built where you must buy things in the auction to win. You put as many cards in the auction pile as you put in your own pile at the beginning of the game, so the chances of you winning any category without auctioning are very slim - the odds of you winning several categories without the auction are basically zero. The third aspect of Biblios that I like is that not all of the cards are in the deck in each game (the number of random cards pulled out is different based on number of players). Because of the rule that you have to have the most points in a category to score, you are often trying to get the majority in that area (at least I was). The inner cover tells you the card breakdown, and so you can know when you have the majority. But! Not all of the cards are in the deck - and so you might have a majority without knowing it. And, a player that is better at figuring out when they have "enough" cards, without wasting extra card draws and money on getting a guaranteed majority will probably win over a player that always guarantees their majority. The final pro that I will mention is that I like the church cards. Now, with that said, I don't like being the one to get stuck with the church cards - I would rather increase my score in one of the categories. 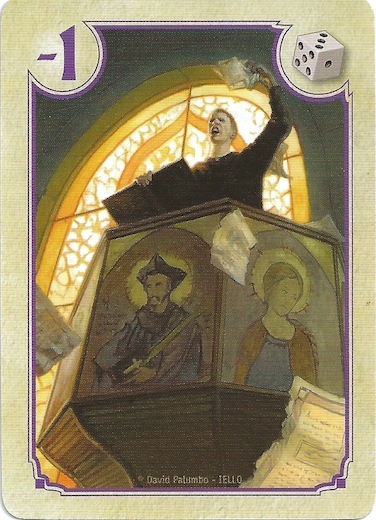 However, the church cards are a good way to mitigate the fact that you know an opponent is going to beat you in certain categories. 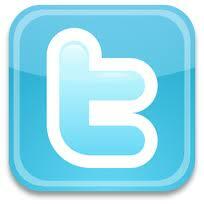 They are also useful for improving the value of your majorities. But, there is a touch of a bluffing element here, because if you are always increasing the value of the same category, your opponents will realize that you have a lot of points there, and they will focus on lowering it. 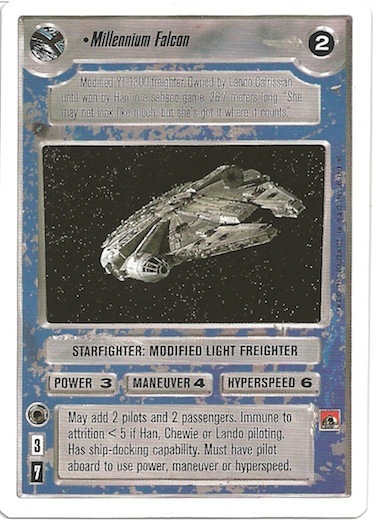 But, at least in the auction phase, you can prevent them from doing so, by buying all of the church cards - but that will get expensive really, really quickly. Overall, I give Biblios an 8.5/10. 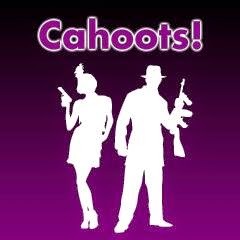 I think that it is a brilliant, light game, that can be enjoyed by gamers and non-gamers alike. If you have the opportunity to play it - do so! If you are looking for games that can be played over lunch, you might also check out 1955: The War of Espionage, China, and Ra. So, some of you may remember the Rise! Review that I wrote a few months ago. Well, while I was writing that review, I was playing a prototype version. Now that I've received a full production copy, I figured I'd share some better photos and a bit what has changed! I'm really impressed by how similar the game looks to the prototype that I received. 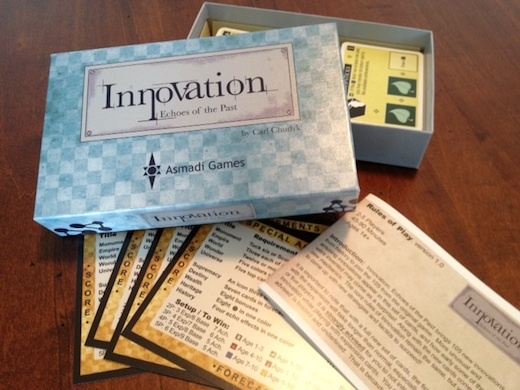 They referred to their prototype as a "professional prototype", and this helps me realize just how much pride they took in those protoypes! The full version has better color (in the prototype "red" looked more like brown), but otherwise, the game looks almost exactly the same. You can "paste on" a theme. 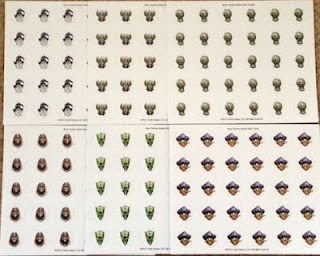 Specifically, there are six different "factions" that you have stickers for. However, you will only be able to use your favorite four - one on each side of the red disks, and one on either side of the blue disks. This, obviously, doesn't change the game at all, but it's a nice little touch. 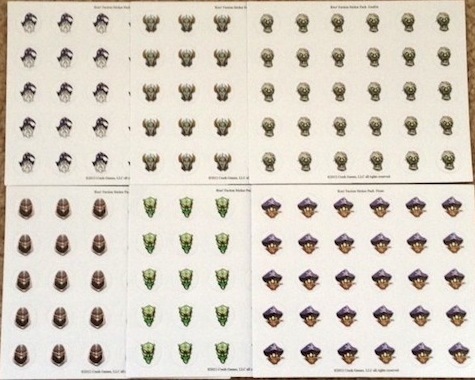 The factions are Pirates, Knights, Aliens, Zombies, Wizards, and (of course) Ninjas. 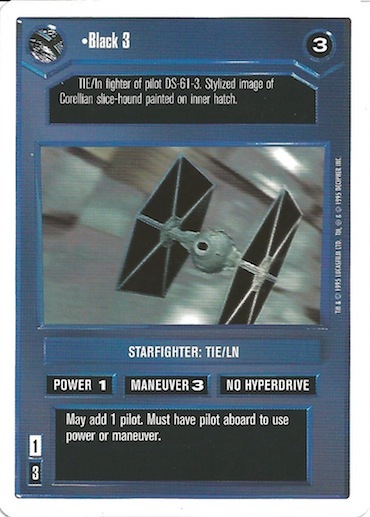 It comes with the "Ballistic Expansion." This expansion provides you with a few extra pieces that seem overpowered. I haven't actually tried them out yet, but I'd recommend playing the basic game a few times before trying these pieces - then play with or without them, however you most enjoy the game! 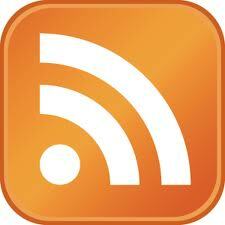 And, again, if you're not familiar with Rise, I'd recommend you checking out my full Rise! review. 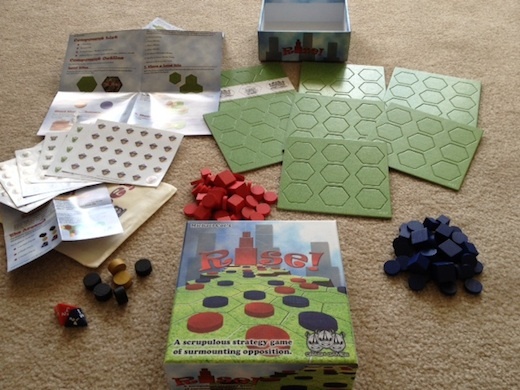 I would like to thank Crash Games for providing me with a review copy of Rise! FIRE!!!! What? Oh right - that's the theme of Flash Point: Fire Rescue. Cool firemen meeples - feeples! The first thing that I like about Flash Point is that I can save action points. Rather, I love that I can save action points. This game (along with all cooperative games that have come out recently) is often compared to Pandemic, so I might as well start the comparisons now. 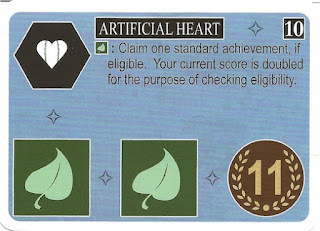 The fact that I often wasted an action in Pandemic is really nuisancey. I love the fact that I can save them in Flash Point. Plus, it just makes sense. Moving into fire or while carrying a victim costs 2 action points. If you couldn't save action points, you would often waste them simply because you had an odd number of points left. Thematically, it seems to represent the fact that you moved halfway to the next location, and mechanically, it works really well, too. After all, if all you do is save action points, then the fire will overwhelm you while you sit and watch, so it's really a self-regulating mechanic. Speaking of theme, that is definitely my second pro. In my opinion (which is the main one you'll find here), the game is bursting with theme. Now, I don't really care especially much if a game even has a theme, but when it has great mechanics and a great theme, it's wonderful. I really think that the theme is most noticeable when resolving the end of turn "advance fire" rolls. I don't know the designer, but I have a hard time imaging him as anything other than a firefighter. The rules are just too specific for me to think he is anything else - I really think that they came from years of dealing with real fires. Smoke re-ignites into fire, flare ups in the building can quickly cause havoc all over the place, improperly stored cleaning materials can explode. Then, you can also chop through walls to get to your POI's - and after all of that, it might have been a false alarm! My third pro for Flash Point is that I really like the different roles. The roles in Flash Point are much more distinct than in any other cooperative game that comes to mind. 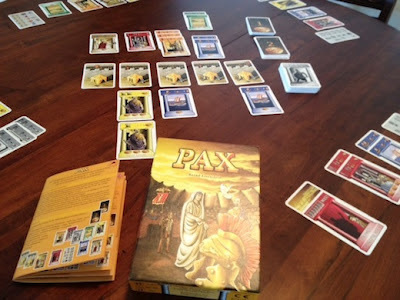 Most cooperative games have the same character, but with slightly different benefits. 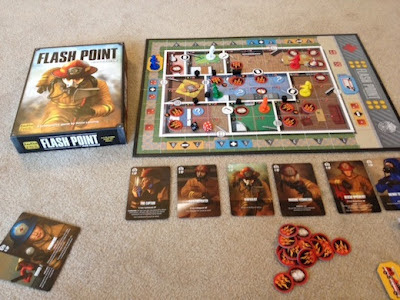 In Flash Point, the different characters have different amounts of action points, and are very specialized at performing specific actions. For example, the Rescue Specialist can be a critical part of the team. She gets her normal 4 action points, plus 3 extra movement points. However, if she is fighting fire (which is not what she's good at), it costs double the number of action points. This means it would cost all 4 of her normal action points to put out a fire on a single square. But, not only do I really like the roles, I also love the fact that you can change out roles. Now, this is probably one of the more shaky things to me, thematically (along with the fact that you get the same credit for saving a cat as a person - and it takes the same number of action points to carry a cat and a person... I digress...), but mechanically it is very helpful. If you start your turn on the fire engine, then you can use 2 action points to take one of the unused characters and continue the game with that character. Again, mechanically, this is amazing. 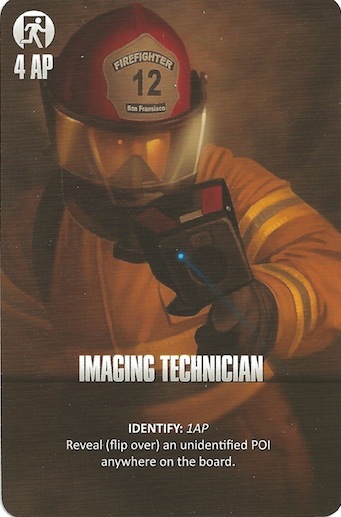 But, thematically, are there really lots of firefighters sitting around waiting to be tagged in? I guess to an extent, everyone might not rush in at once until they know more about the situation, but it still seems odd. The one point of the game that I'll mention before getting to cons is dice rolling. It's important to realize that, to simulate the randomness of a fire, the "advance fire" part of the turn involves a lot of dice rolling. As with any dice game, this means that crazy things can happen. 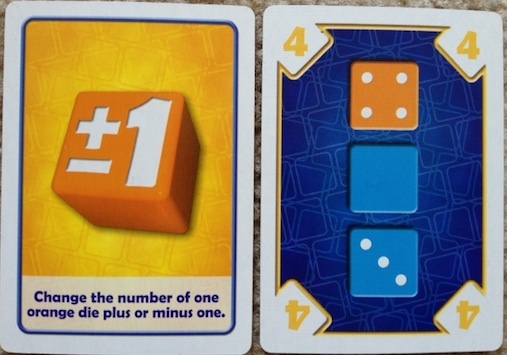 Rolling dice never works out statistically how it "should" (if I roll a 1 on a 6-sided die, and then I roll it again, it's not going to be friendly and go "oh, he rolled a 1 last time - I shouldn't roll that again until he's seen all the other numbers.") What this means in game terms is that you might be able to extinguish a lot of the early fires and then just deal with smoke popping up. Or, you might roll flare ups every turn and have the entire building explode regardless of how well you (intended to) play the game. In the games I have played, the dice have worked well and have been a good balance of explosions and smoke. 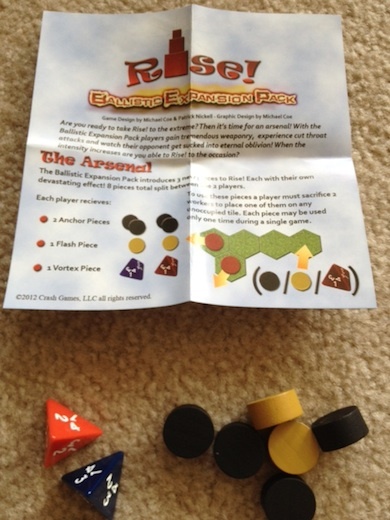 However, in one of the games we played, nobody rolled any flare ups until one person rolled about 4 of them in a row. This is just something to be aware of. Really, I only have one con for Flash Point. The advance fire section of the game is a bit fiddly. I think that there are two reasons for this - first, there are simply a lot of steps that you have to check for and then perform if appropriate. Second, Flash Point uses similar sounding firefighting terms that aren't part of my normal vocabulary. For example, what's the difference between a "Flashover" and a "Flare Up"? I've played the game several times, and I still had to just look up which one was which. This causes you to spend a decent amount of time grabbing the instructions and going, "ok, what was that again?" After you play it through several times, this upkeep phase will become much more fluid, but it still remains a touch fiddly. Overall, I give Flash Point a 9.0/10. I expected it to be a good game, but what I found was a game that rivals Pandemic or any other cooperative games, trying to be my favorite. 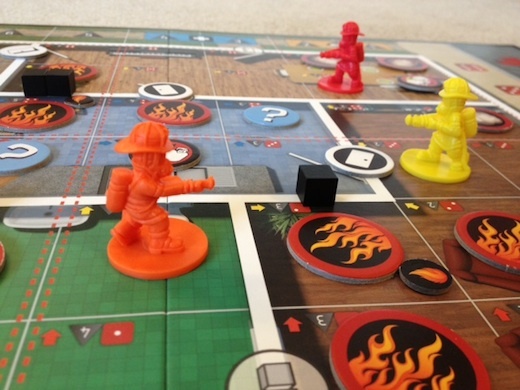 If you want a second opinion, check out the Board Game Family's Flash Point: Fire Rescue. 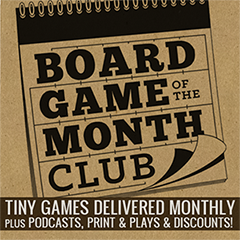 If you want to read about other cooperative games, you should check out Yggdrasil, Space Alert, and Forbidden Island. I would like to thank Indie Board & Cards for providing me with a review copy of Flash Point: Fire Rescue. The reigning king of dexterity games, to me, has to be Crokinole. 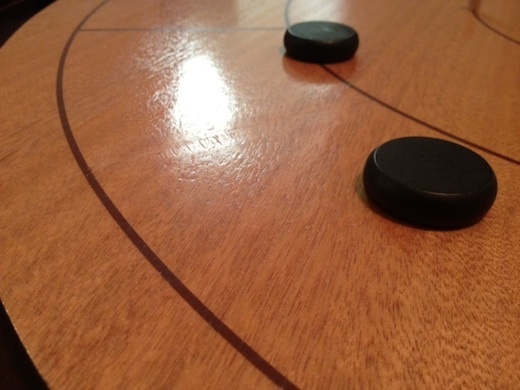 Crokinole, like Chess, has a lot of different manufacturers that create boards. So, here I will review the game itself and then will review the Mayday Games board, as it is the one that I have, and it will let you know if it would be a good choice for you. In Crokinole, the goal is to score more points than your opponent by having your disks close to the center of the board at the end of each round. The game can be played by 2 or 4 players (on teams). 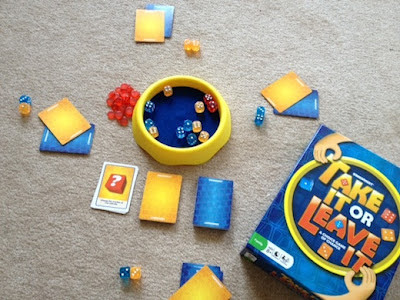 The first player takes a disk and shoots it towards the middle of the board, where there is a hole slightly larger than a disk (and is worth extra points if your disk lands in this hole). After this initial shot, each player must hit one of his opponent's disks, assuming they have one on the board, in order for his shot to be legal. 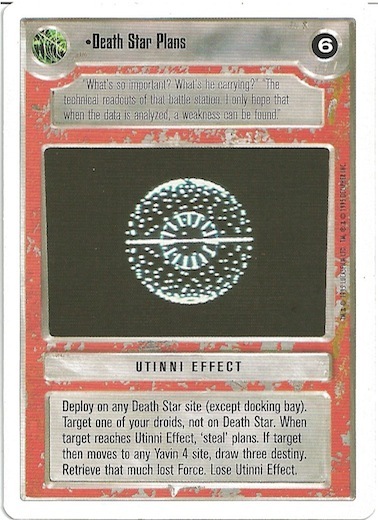 If you don't hit any of your opponent's disks, then your disk is removed, along with any of your other disks that it hit on that turn. And, to make things trickier, there are several bumpers lined up around the center of the board, obstructing your shooting line. Play alternates back and forth like this until all of the players run out of disks. Then, whichever team scored more points gets a number of points equal to the difference between the two scores (so, if one team scores 20 and the other scores 15, then the first team gets 5 points). The first team to 100 wins the game! The second pro works very well with the first one - I love the bumpers. Hitting your opponent's disk on a big round board really isn't terribly hard. Assuming you can line up the disk and shoot it straight, you can handle this. Of course, with the bumpers, you have a lot harder time lining up those shots. The bumpers can be used both intentionally and accidentally to your advantage (or disadvantage). You can try to hide your disk behind a bumper to give your opponent a harder shot - or you can bank off of a bumper to hit your opponent's disk. Of course, you can also accidentally hit a bumper and then deflect into another one of your disks (or two) and miss him entirely - thus costing yourself a lot of points. Or, more commonly, you can slam straight into a bumper and go careening straight back off of the board. 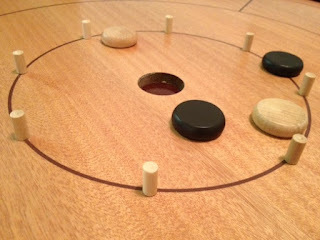 Overall, though, the bumpers (along with having to shoot at your opponent's disk) do a fabulous job of setting Crokinole apart from any other dexterity games that I've played. And, in this case, "set apart" means better. Just as a brief aside, I will mention why I currently enjoy Crokinole better than PitchCar (my second favorite dexterity game). PitchCar is sweet and allows for customizing the gameboard. But, the downside of this customization is that any minor imperfections in the board are translated into ridges on the track that will send your disk flying. 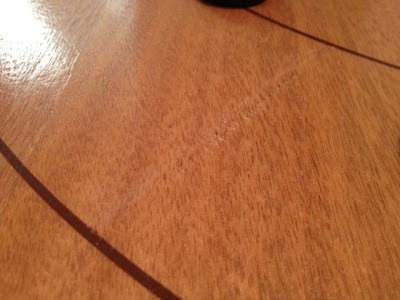 Crokinole, since it is played on a single, unified board, avoids this issue. Though, I really think that both games are awesome, and I plan to continue playing them both. 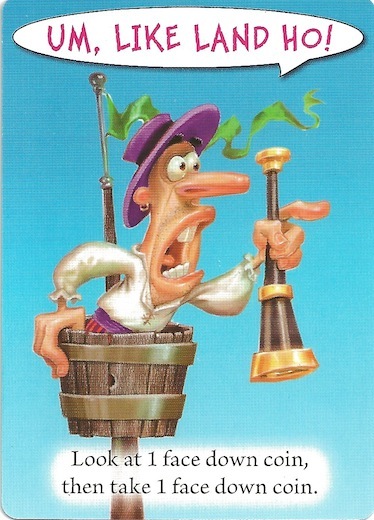 Now, with that said, I can only think of one con for Crokinole. If all of the players are really, really good at the game, then it is hideously boring. Everyone would simply take turns shooting the disk into the middle. 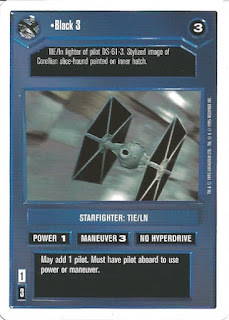 This then removes the entire first pro - there is never an opponent's disk to shoot at. 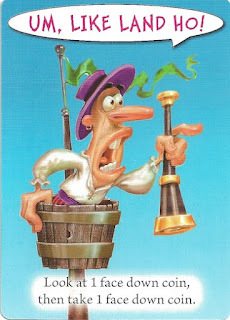 However, if you're good enough that you are really running into this con a lot, then you should probably be competing in Crokinole tournaments! 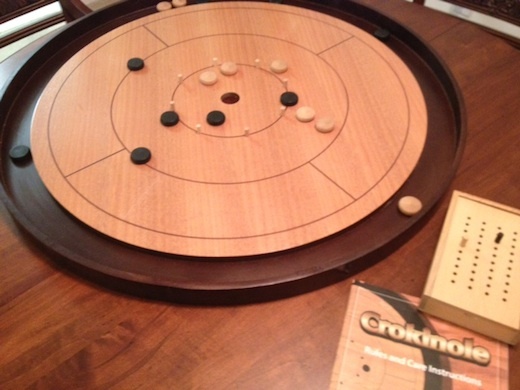 Overall, I give Crokinole a 9.5/10. As I said before, I consider it the reigning king of dexterity games. I absolutely love this game. Now to turn our attention to the Mayday Games Crokinole board. Crokinole boards, from what I've seen, generally range anywhere from about $150-$500 (or higher). There are a lot of absolutely gorgeous, handcrafted boards, but these are (as you'd expect) generally on the higher side of the price spectrum. 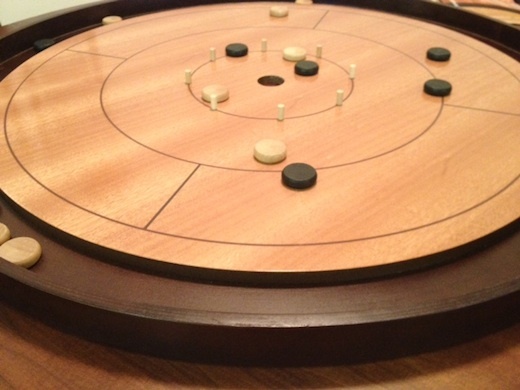 The Mayday boards, however, are by far the most inexpensive way to play Crokinole. (Well, aside from convincing your friend to buy a board and play with you!) I've even seen them on sale for around $110 before! 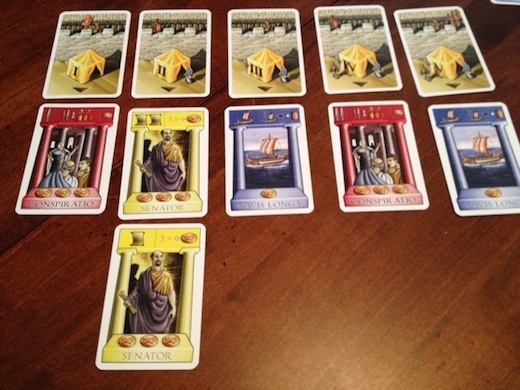 Here are the big pros for my Mayday board - it is inexpensive, and it plays great! I have played it quite a few times already, and I've not run into any problems with it. The play area is smooth, the disks slide well, and the bumpers work like a charm. If you only care about playing Crokinole, and not having an immaculate board for display, then I highly recommend this board. Plus, the board comes with eye hooks installed on the back so that you can run a wire across the back to hang it on your wall, if that is your preferred method of storage (though, ironically, the "how to take care for your board" part of the instructions tells you not to do this). The board also comes with a nice wooden box for keeping score and storing your disks when you're not playing. Overall, as I said before, I'd recommend the Mayday Crokinole board to anyone that is looking for a board simply for playing Crokinole. If you're looking for a display piece, then I think that the handcrafted boards are probably a better option - especially since you can choose different patterns, etc, that you like. If you like dexterity games, you should also check out Catacombs, Caveman Curling, and (of course) PitchCar. Or, if you want to read more about Crokinole itself, there is a Crokinole Review at Play Board Games, and another review of Crokinole on I Slay the Dragon. 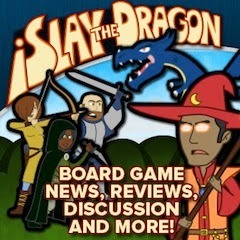 I would like to thank Mayday Games for providing me with a Crokinole board for review. EDIT: After talking to a few of my readers, I feel that it is important to point out a few things. First of all, this review is based on my experience, which was a positive one. I dealt with a customer service rep named Jeremy, who was incredibly friendly and helpful. There was a shipping miscommunication along the way, but everything was worked out with no problems (this is not the first time I've run into this with review copies from different companies). Other people have had differing experiences with Mayday, some of which sound shady, to put it mildly - I'm sure if you search Google, you will quickly find what I'm referring to. Again, this was not my experience, and I feel that it is important that both experiences be expressed - both negative experiences (which have been expressed elsewhere) and positive experiences (which I have expressed here). In the same way that I hope you do not buy any game based strictly on my opinion, but you balance it with the opinion of other reviewers, I would hope that you read other opinions on this game as well.